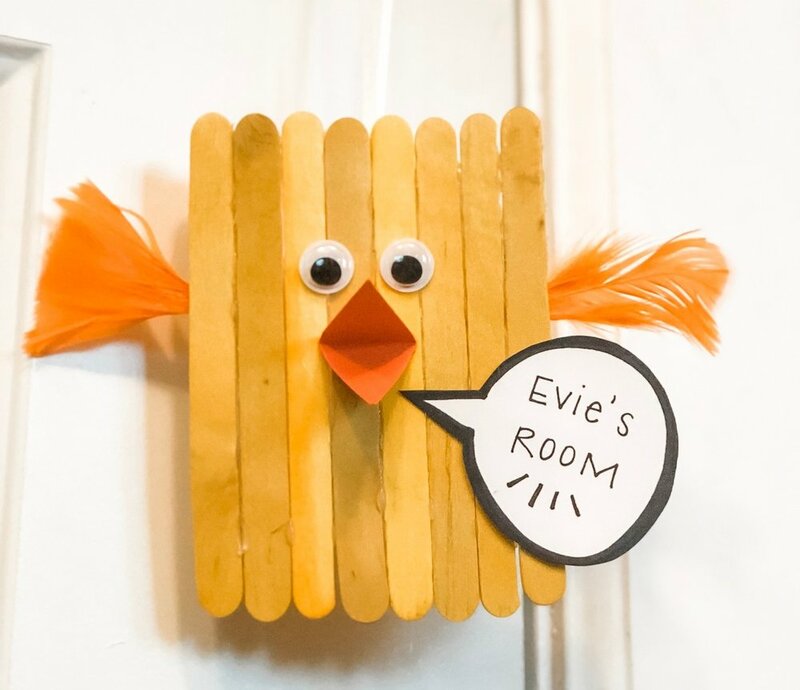 My 7-year-old daughter’s bedroom door is usually covered with signs that scream “NO BOYS ALLOWED.” When she gets home from school this afternoon, I’ll show her this little chickadee I made for her, which has a much sweeter, more welcoming vibe, and try to convince her to leave it up through the spring (think she’ll go for it?). Follow the steps below to make your own! Lay down 8 popsicle sticks on your work surface, with their sides touching one another. Glue them together. Glue an orange feather on either side. Cut 12-18” of ribbon or twine and knot it to form a loop. Glue the knot to the top of the popsicle sticks. Set aside to dry. Meanwhile, cut a triangular break from your orange paper. With your black marker, draw a word bubble on your white paper. Write something inside it, then cut it out. When your popsicle sticks are dry, flip them over. Glue on the googly eyes and beak, then glue on the word bubble. Hang on your child’s bedroom door and admire!